OK so the drop cloth shades are still draped on the kitchen table. But the hardware has arrived! A day trip to Chicago also got me off track a little. No museums this time, just Ikea and the Rainforest Cafe. Ever been there? We took Anri to one in Tokyo when she was really little. It's fun if you have kids who've seen Nemo. Dori is everywhere! Then there's also the "A Door A Day" project that's keeping be from my shade project. The plan was to paint all the dingy doors a nice bright white in less than two weeks. I think that'll be more like 3 weeks, but at least I've finally started. 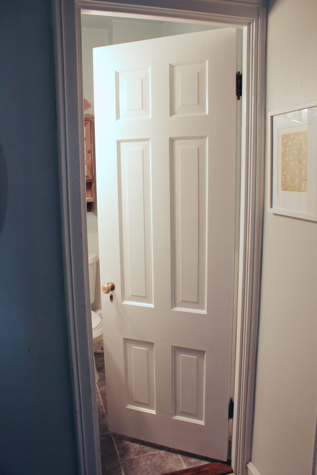 We've been living with cream colored doors surrounded by white trim for a little too long. 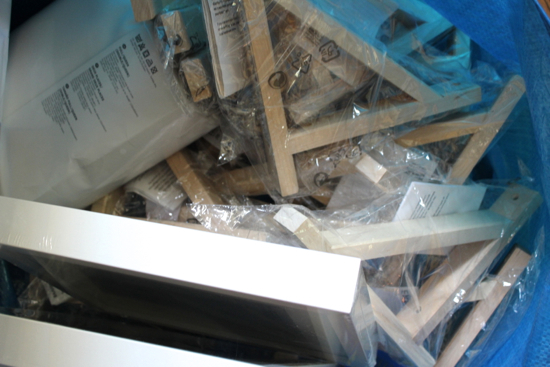 So how about I show off my Ikea purchases? Remember the pink stools I'd planned to put in the basement? 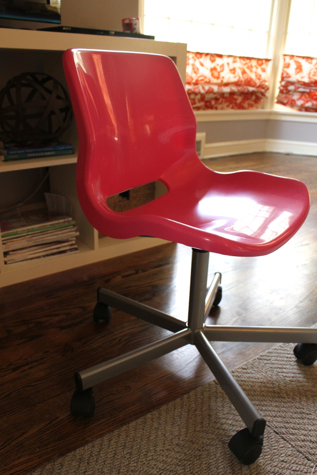 Well, I found these pink swivel/rolling chairs for $20 that are even better. $20. How is that possible? I bought two, but I'll definitely pick up more on the next trip. They're adjustable, so I can decide later if I want a counter height or lower table. This will definitely save me the hours it would have taken to sand down and paint 4 to 6 stools. several white picture frames. 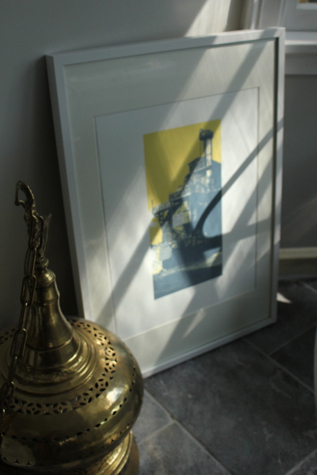 Now I can finally hang this great woodcut print that we bought at an art fair this summer.